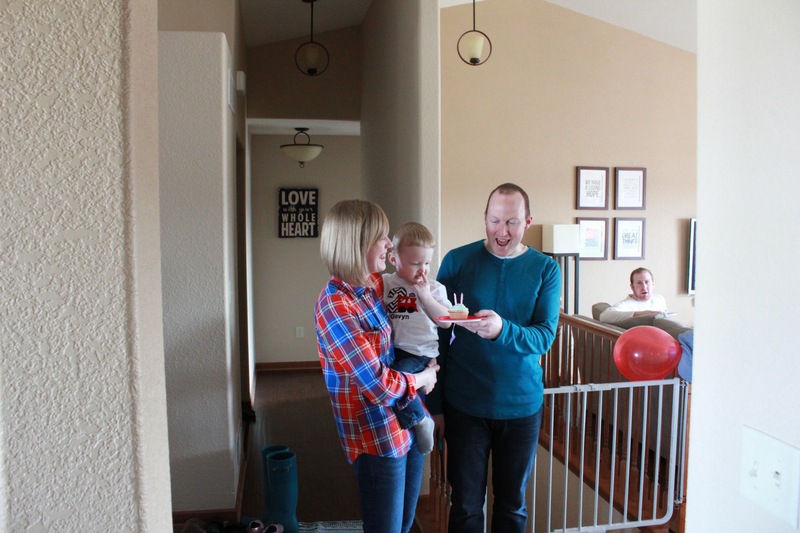 I couldn’t let the months keep passing by without doing a quick blog post about Gavyn’s 2nd Birthday Party! 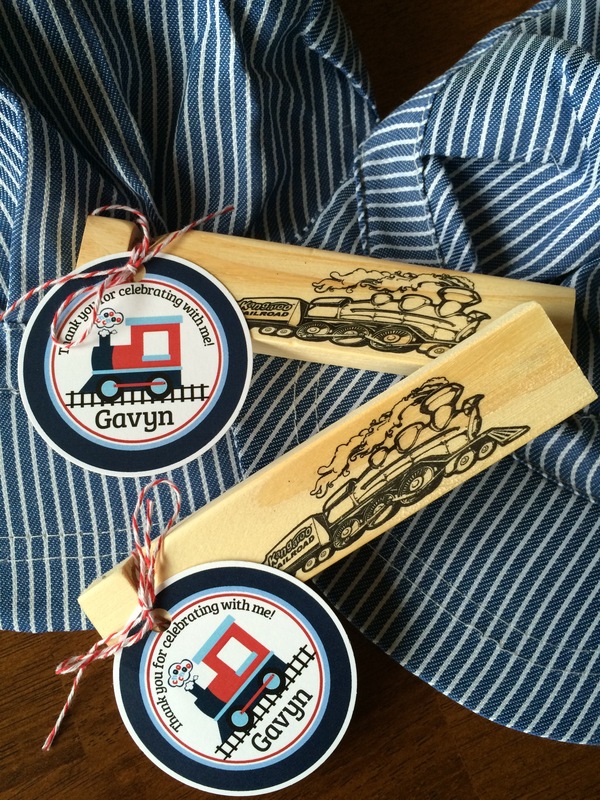 We chose a train themed party for Gavyn this year, and we kept it simple, but it was still fun to plan! 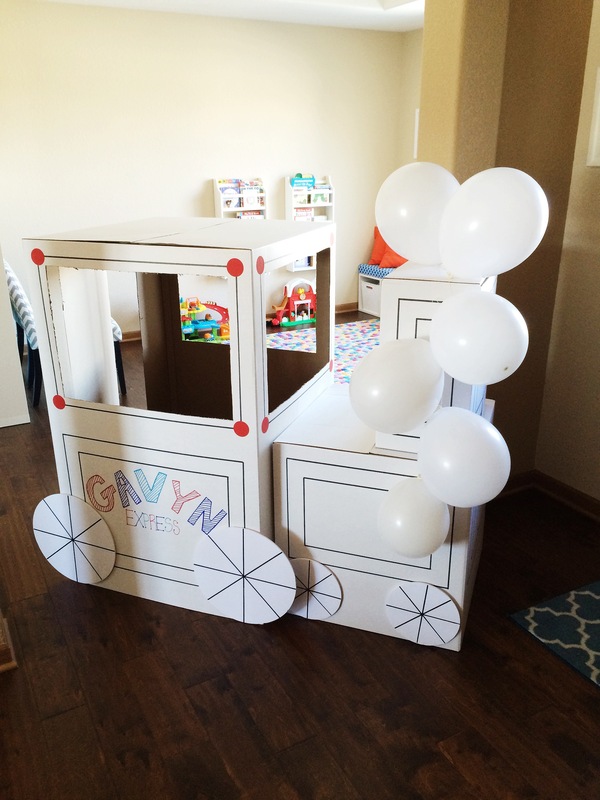 I actually love planning and organizing parties, but with our move being around the corner, I knew I needed to scale back on Gavyn’s party this year as compared to his 1st Birthday Party. I, of course, started my search for ideas on Pinterest, and definitely came up with a few good ones on there. 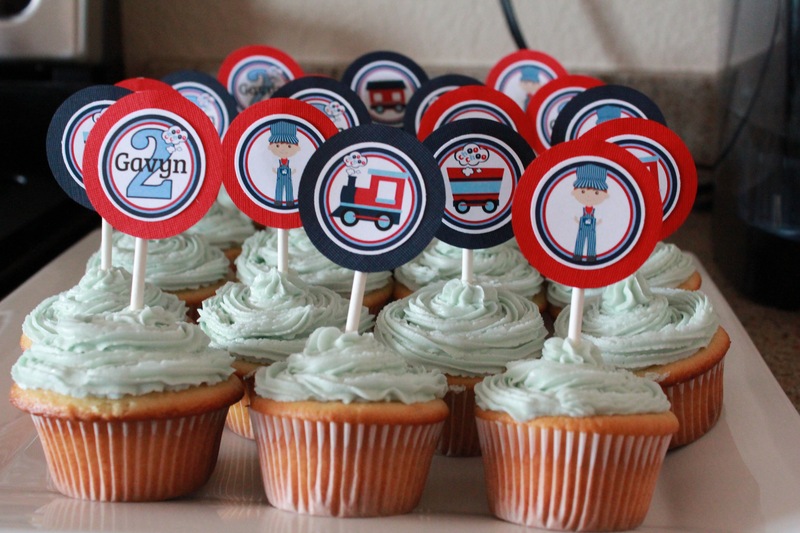 I even got adventurous and made my own cupcakes and cupcake toppers for this party, and they turned out super cute! I wanted to just highlight some of the things we did, in case you are looking for some ideas for your own train party. DIY Cardboard Train: My handy father-in-law was able to make us custom-sized boxes and wheels that attached with velcro, and Bryan and I just had to cut out the windows and decorate the train! The train was a hit at the party, and we have gotten great use out of it since. 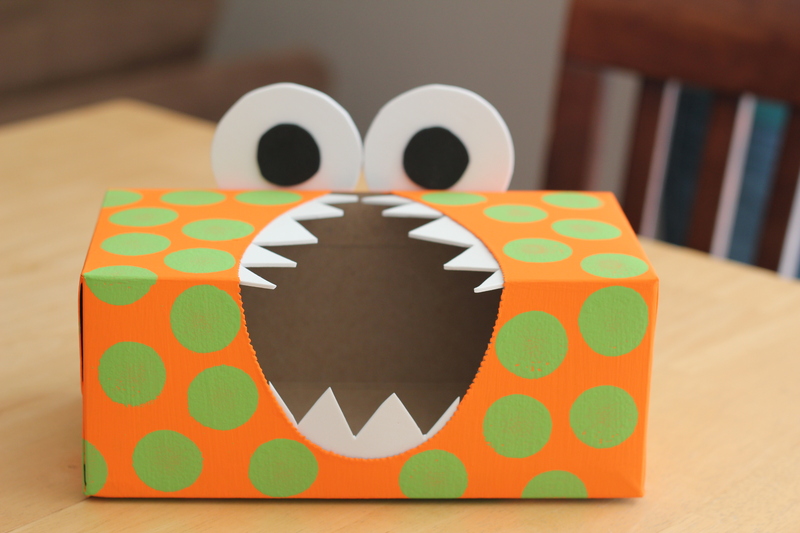 If you can’t have boxes made for you, any type of box would work — just decorate it however you would like! We used string and white balloons to create the engine “steam”. 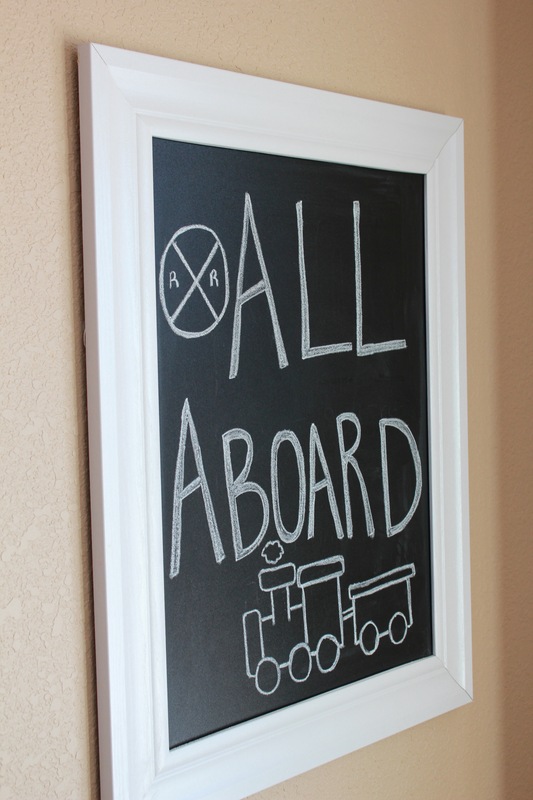 Other Decorations: I used our chalkboard to make a little sign, and then I searched through all the kids’ toys to find a few trains to use as centerpieces and such. We blew up a few red and blue balloons, too. 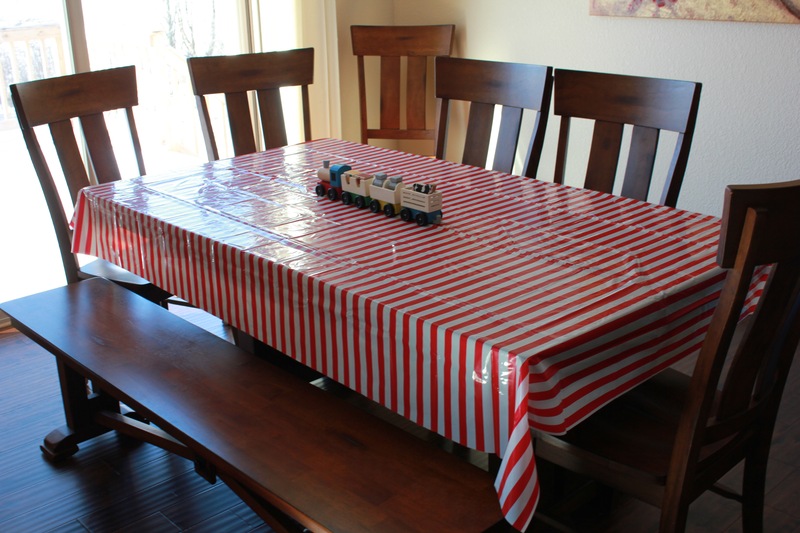 The tablecloth is from Target. Cupcakes: I altered a box cake mix to make the cupcakes and made homemade frosting, as well. 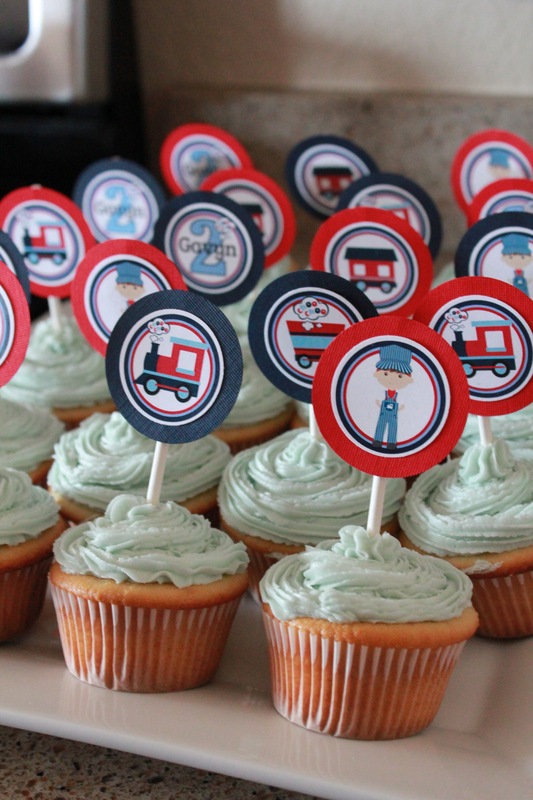 The toppers were ordered from Ciao Bambino Designs, and I then attached them to blue and red card stock circles. I made the circles using a circle punch. I used hot glue to attach the circles to mini sucker sticks (from Hobby Lobby). This whole project was fun and easy and it made the cupcakes seem a little more fancy! Birthday T-Shirt: I ordered Gavyn’s shirt from Ruffled Rose Boutique on Etsy. 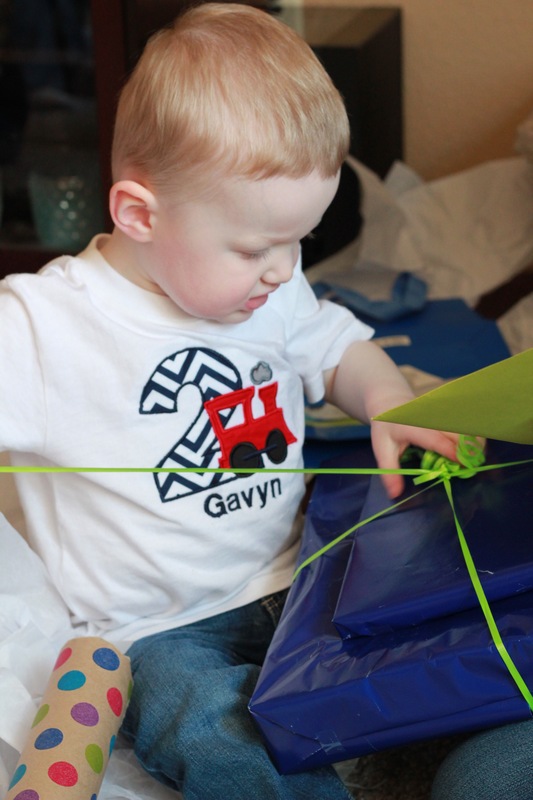 It was fun to watch Gavyn be so much more interactive during his birthday party this year! He loved blowing out his candles and opening presents. 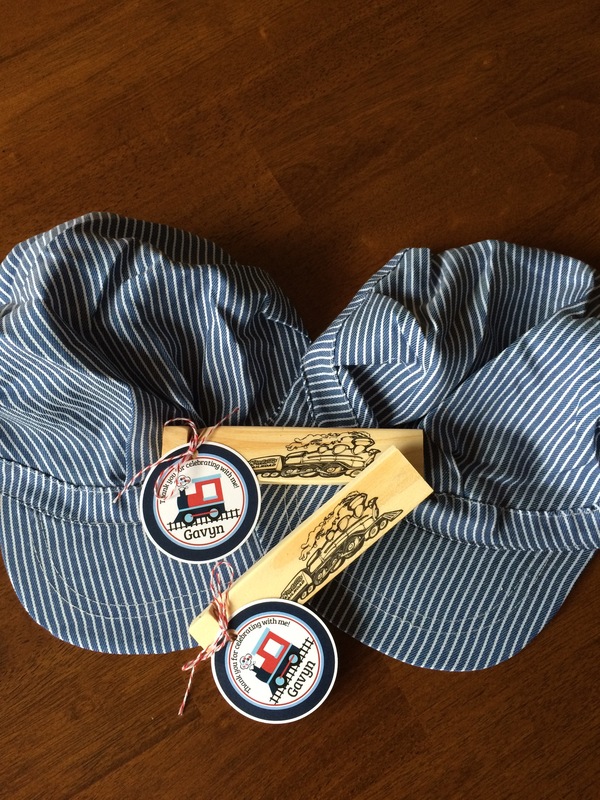 Party Favors: Each kid was given a conductor hat and a train whistle (both from Amazon). The little tags were also ordered from Ciao Bambino Designs, and I just tied them on with a little bit of decorative string that I had. 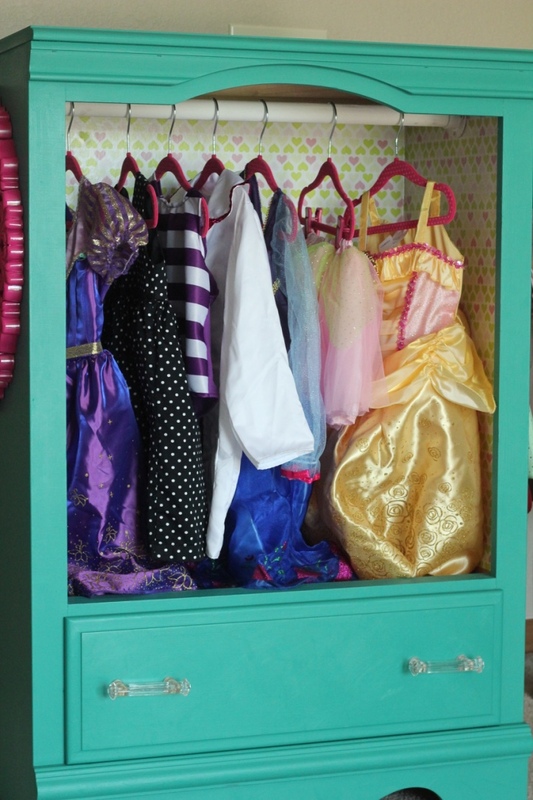 Madalyn has really been enjoying dressing up as of late, and the organizer in me knew that we needed a place to neatly store all of her dress up clothes and accessories! The sentimental side of me also wanted to re-purpose a dresser that I had been storing — this dresser was part of my bedroom furniture growing up, and I was really excited to be able to turn it into something really useful and pretty for Maddy! 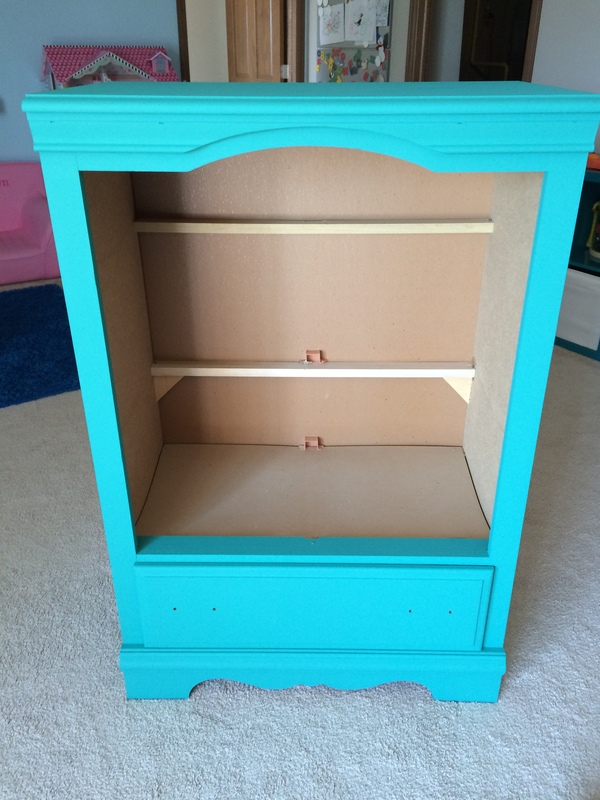 This was my first experience using Annie Sloan’s chalk paint, and it was a really positive one. 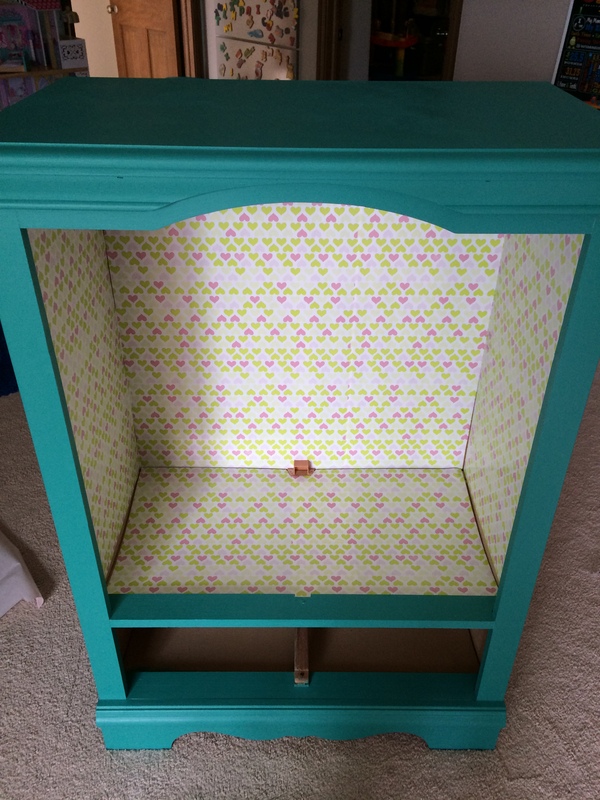 I am already looking for other pieces of furniture to paint! The best party about the paint, is that you don’t need to sand the furniture at all. 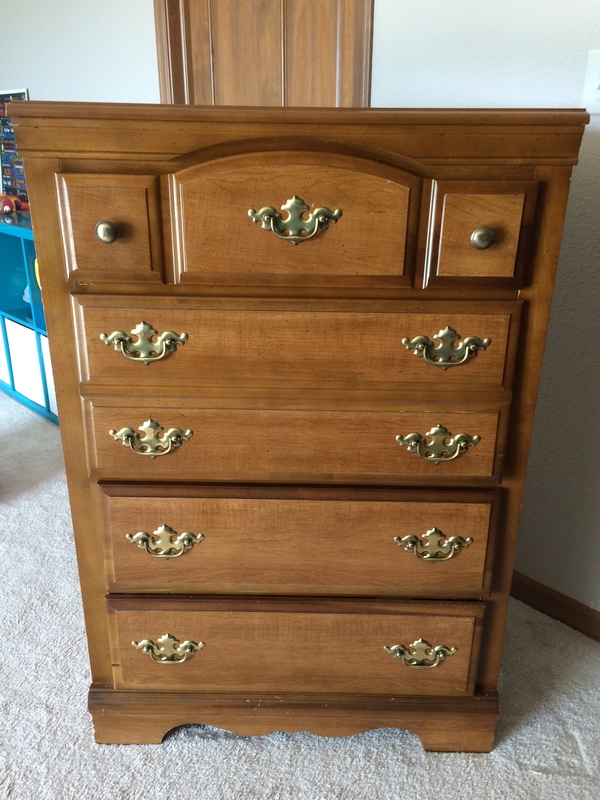 As you can see, the dresser I used had a super shiny finish to it, and it did not require any sanding to still end up with a smooth, non-shiny surface after painting! I also think that the cost for the paint is reasonable especially when you consider you are getting a completely different looking piece of furniture in the end. 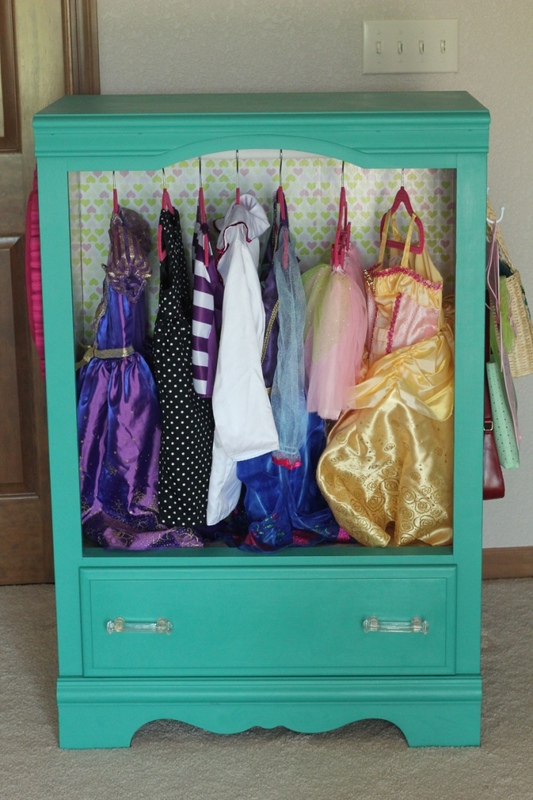 I wanted to give a quick tutorial on how I turned this dresser into a dress up wardrobe, and what supplies I used. 1) Remove any drawers you are not going to use. 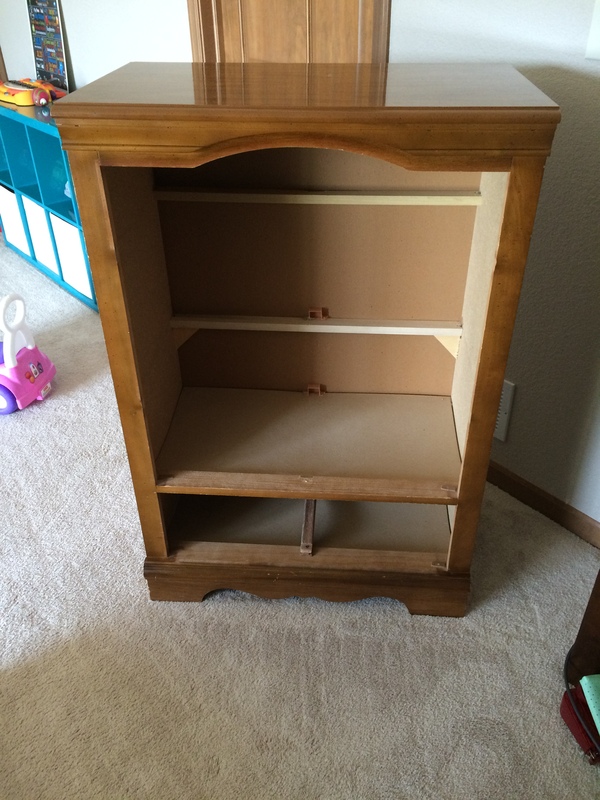 Remove drawer pulls from the drawers you are going to be painting. 2) Clean off the furniture. This is really important! There are multiple ways to prep the furniture before you paint it, including using mineral spirits or rubbing alcohol. Your paint may not stick if the furniture isn’t clean — so don’t skip this step even if it looks clean! 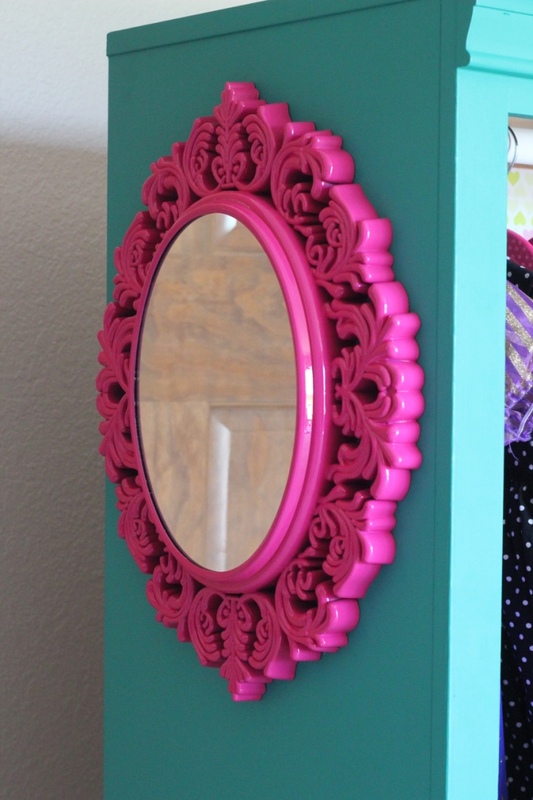 3) Paint on your chalk paint! This paint was SO easy to use! I did two coats of paint on this dresser and the drawer. The first coat was dry in probably less than an hour. 4) Apply the wax coat. This was the scariest part, but it was so easy! I just ripped up an old t-shirt and used that to smooth on the wax (the Annie Sloan wax brush was pricey so we skipped that and went for the economical option!). If you look really closely, you will see some streaks, but it doesn’t matter because it all just blends in and dries really nicely! I just used one coat of wax, but if you are going to be frequently touching the painted parts of the furniture, it does recommend using a couple of coats. 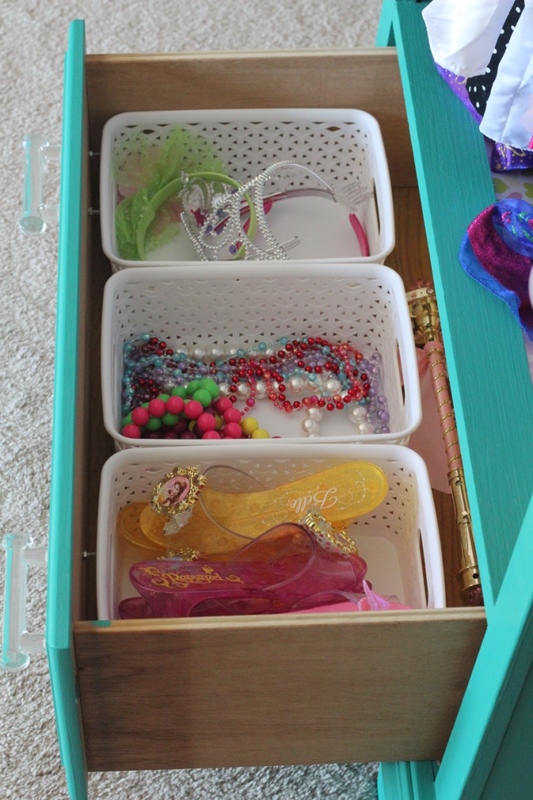 5) Line the inside of the dresser with ConTact paper. I did this because I didn’t like how the inside of the dresser looked and I wanted to pretty it up a little bit! 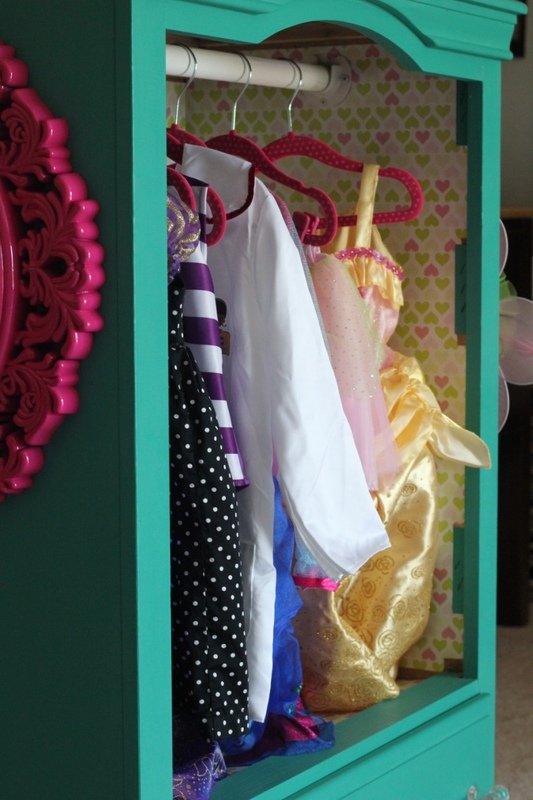 6) Cut your closet rod down to size and spray paint it if you desire. Attach it to the inside. 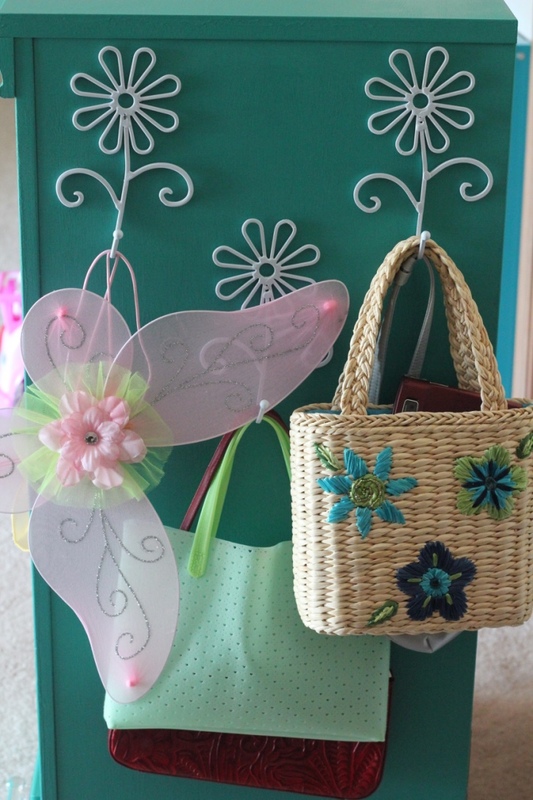 7) Attach your drawer pulls. 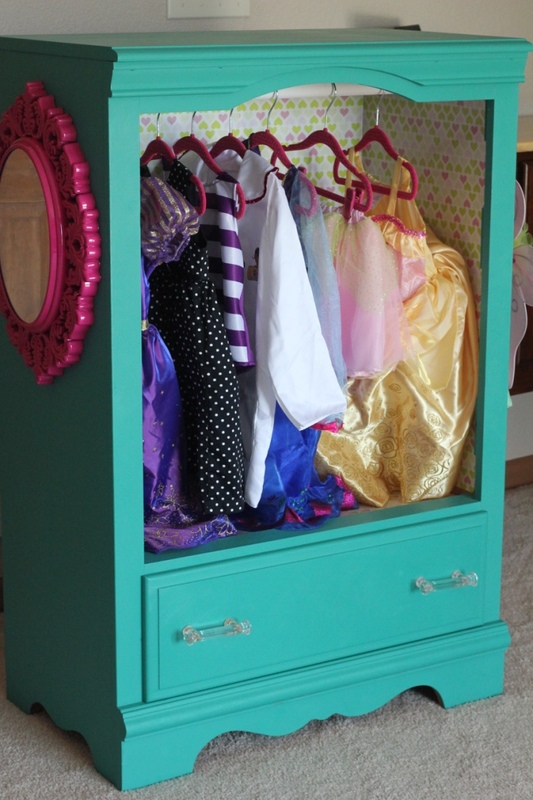 8) Hang the mirror and the hooks on the sides of the dresser. 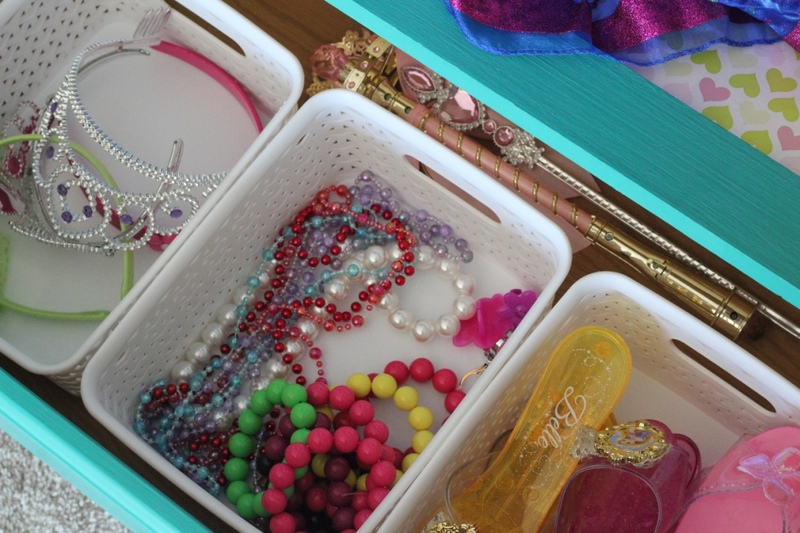 9) Organize all of your dress up clothes and accessories! 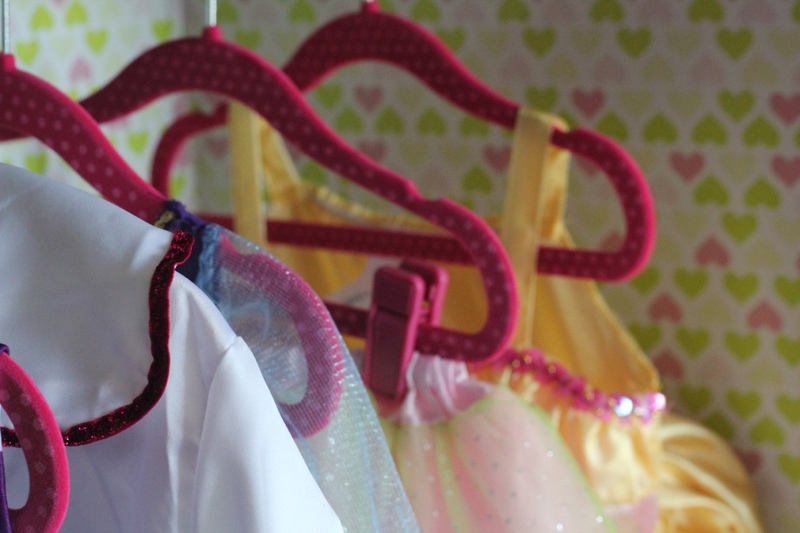 Madalyn loves her new dress up wardrobe, and I love that she has an organized place to store everything! Win-win! What do you think? Brave enough to try out some chalk paint now that you see how easy it is?! 1) Spray the silicone muffin pan with cooking spray, making sure the holes are entirely coated. 2) Make the jell-o, according to the box, BUT use 1/2 of the amount of water. I used 1/2 the amount of both the hot AND cold water that the directions call for. 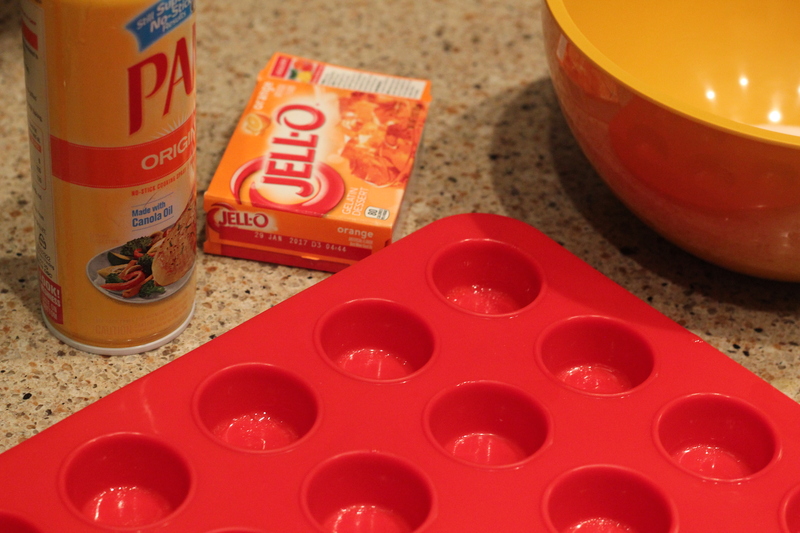 3) Pour the jell-o into the molds and allow them to set. 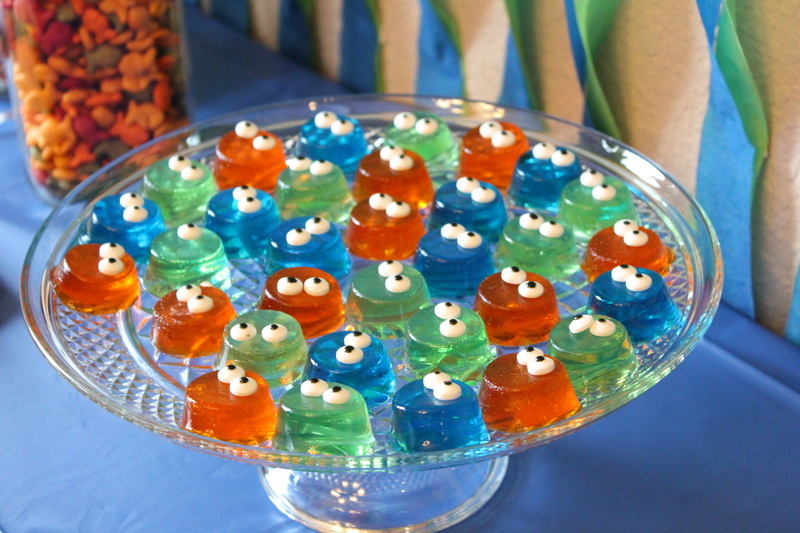 4) Add the candy eyes right before you are ready to serve them. They will slide around and melt off of the jell-os after they sit on them for too long, so I would wait to do this until an hour or so before you are going to serve them. 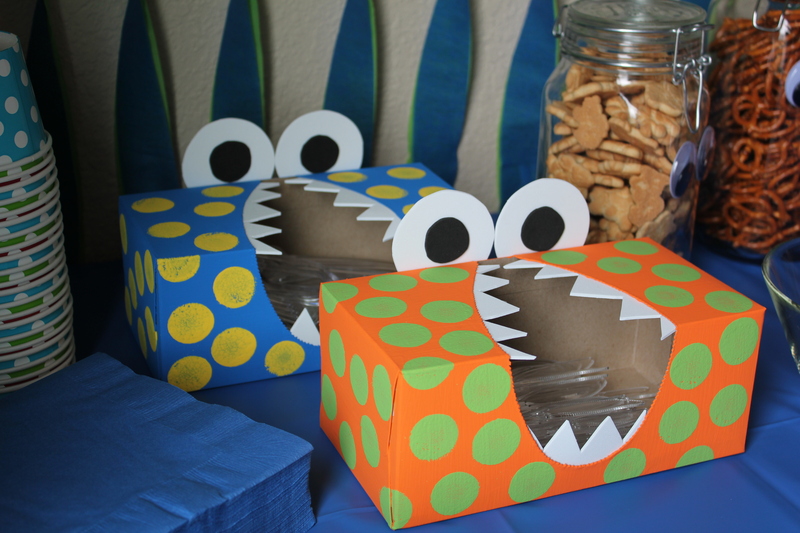 These were a fun snack for both the kids and adults alike! 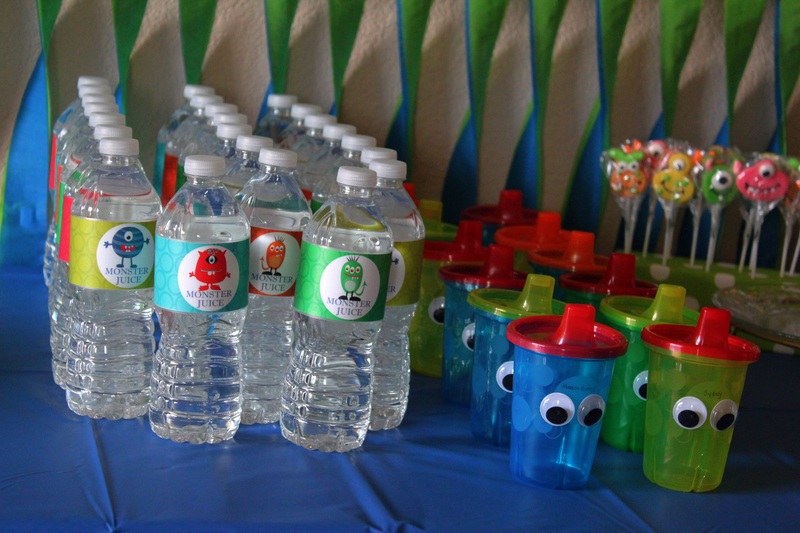 On a completely unrelated note, I just wanted to mention that the little Monster Sippy Cups I made are another SUPER easy craft that you can do yourself for a monster themed party. 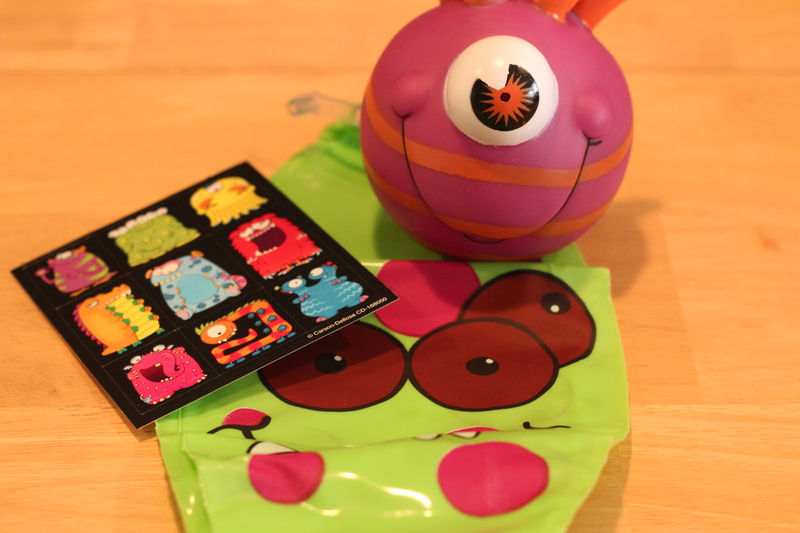 I hot glued plastic googly eyes (from Michael’s) onto Take & Toss sippy cups. They turned out super cute and the eyes are actually still on ours (I hand wash the cups! 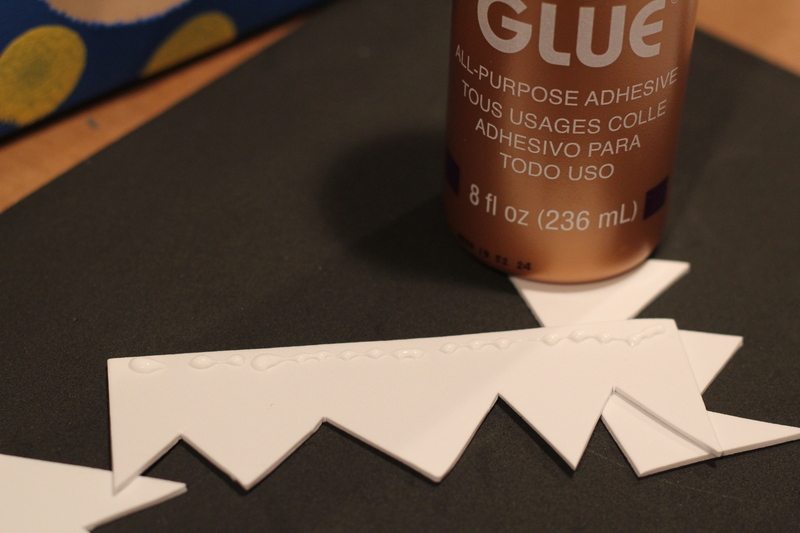 ), but you could easily peel them off too if you wanted to remove them — the hot glue is not permanent. I hope these posts have been helpful! This was one of the most fun parties I have ever planned, and while Gavyn won’t remember it, I hope all the family and friends there had a blast! 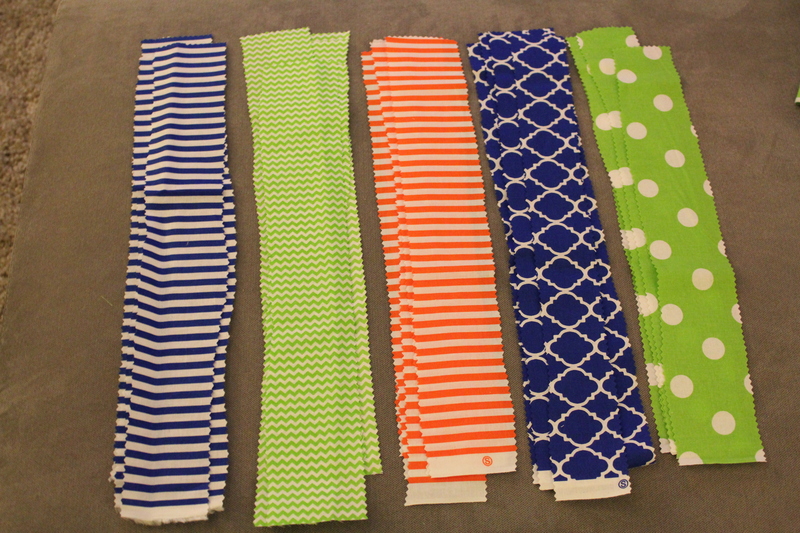 1) Cut your fabric into strips, using the pinking shears. The length and size of these strips is completely up to you! I did a few trial and error strips to figure out what would work best on our particular high chair. 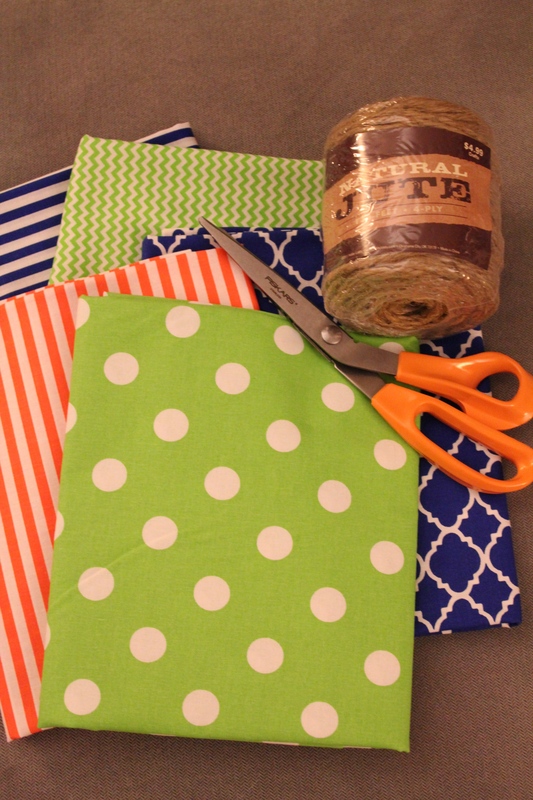 I used five different patterned fabrics, but you could use as little or as many as you want. 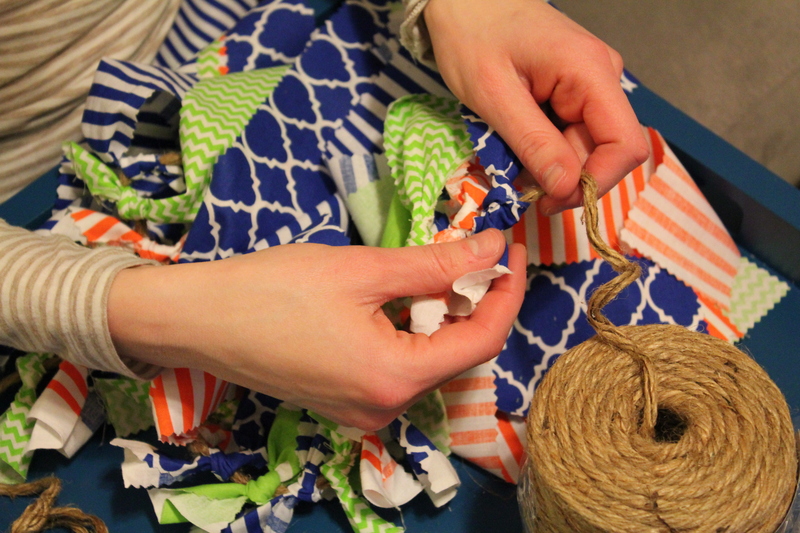 2) Tie the individual strips to the jute. I just tied them in a regular knot and they held just fine. Remember, fabric is light, so it shouldn’t require too much intense adherence. 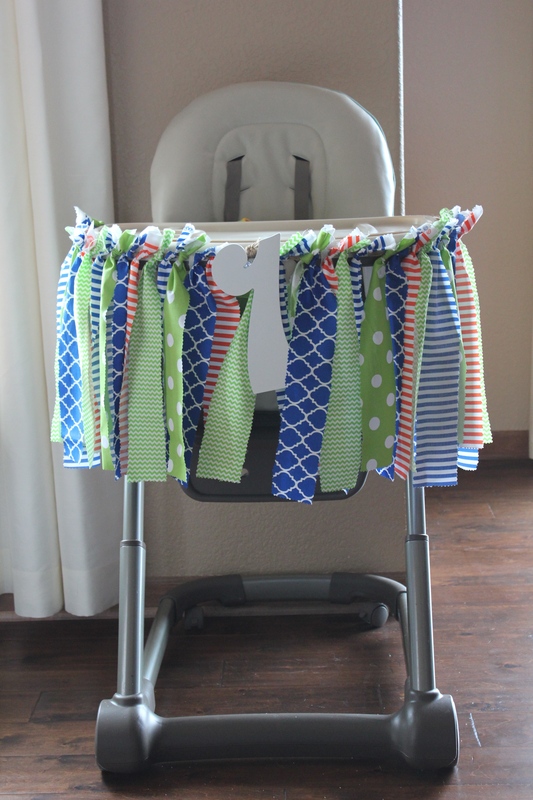 3) Hang your jute onto the high chair. I used some regular masking tape to attach it to the underside of the high chair. 4) Optional: Attach your wooden number. I used jute to tie it onto the jute string. That’s it! 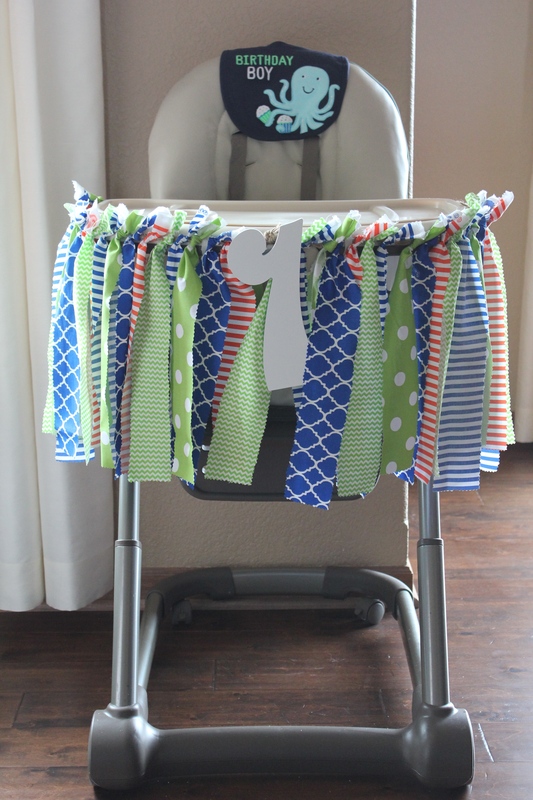 Super easy and a nice addition to the high chair for the birthday boy’s first cake! 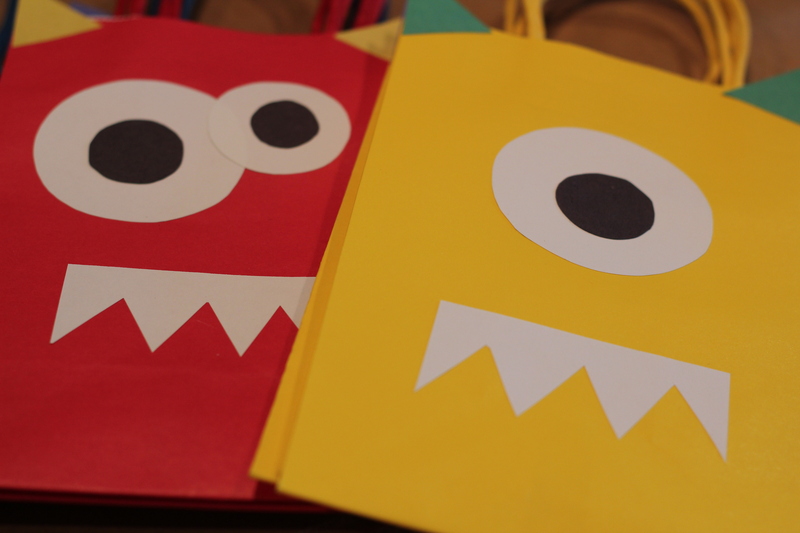 I have one more post to finish up the DIY’s from Gavyn’s first monster birthday party, but then I’ll move on to something else! I hope you can use this specific tutorial and really cater it to any birthday party or theme! 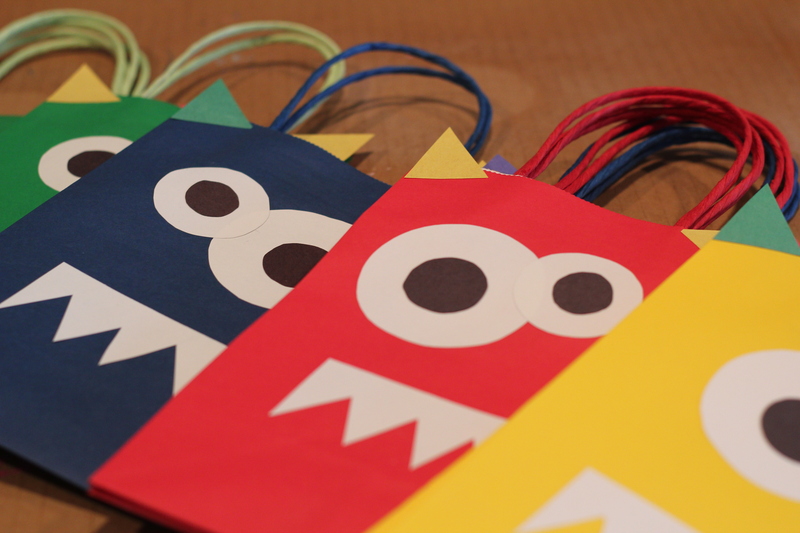 Another fun DIY from our monster birthday party were these little monster favor bags! 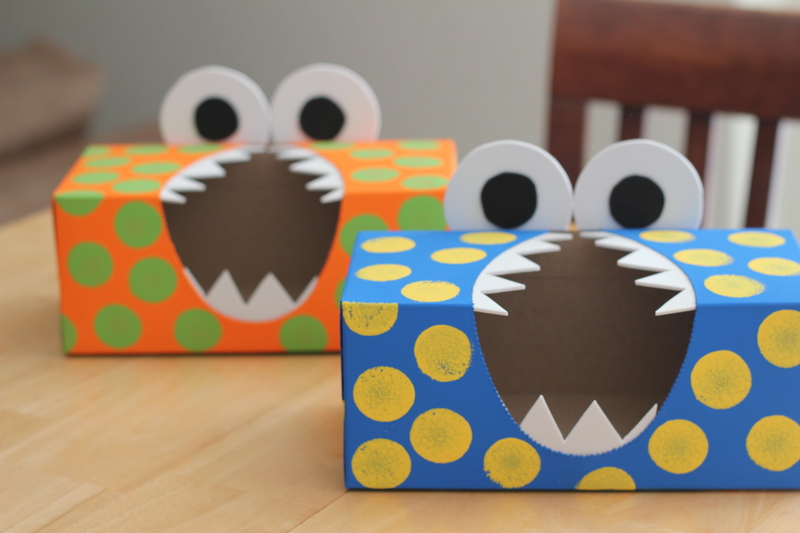 These are a really simple craft! 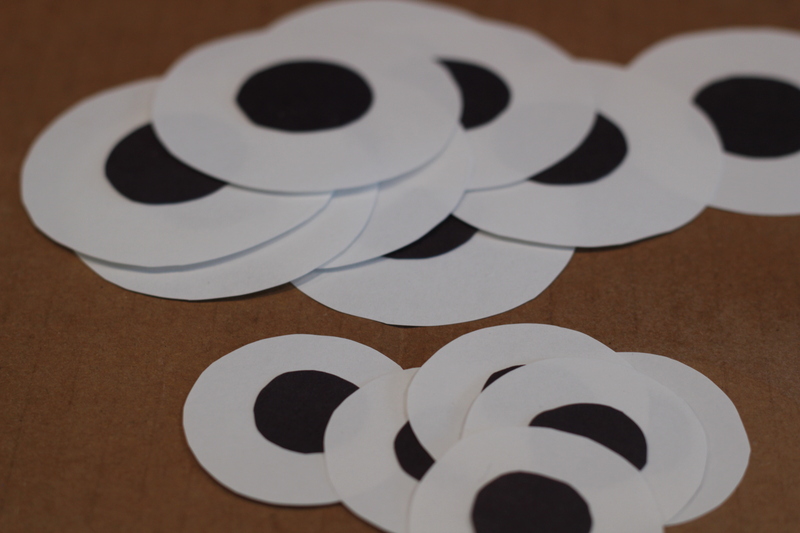 1) Trace circles for the eyes. 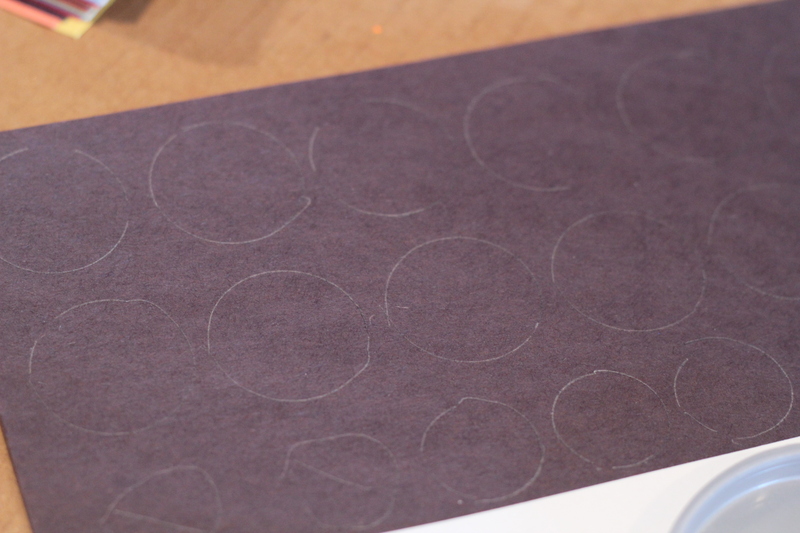 Trace larger circles on white paper and smaller ones on the black construction paper. Glue the smaller ones onto the bigger white circles. Use whatever you have around the house for tracing! These are monsters — no need for perfection! 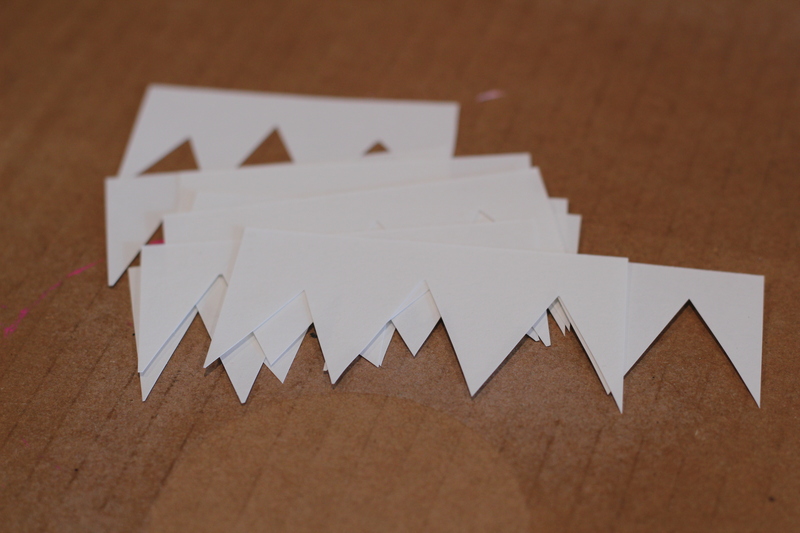 2) Cut teeth out of the white construction paper. 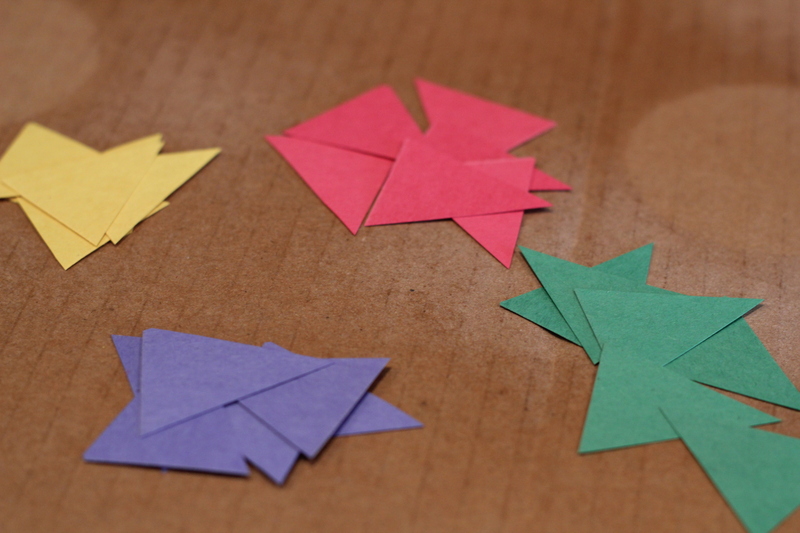 3) Cut little ears out of construction paper – you can use the colors of your choice for this! 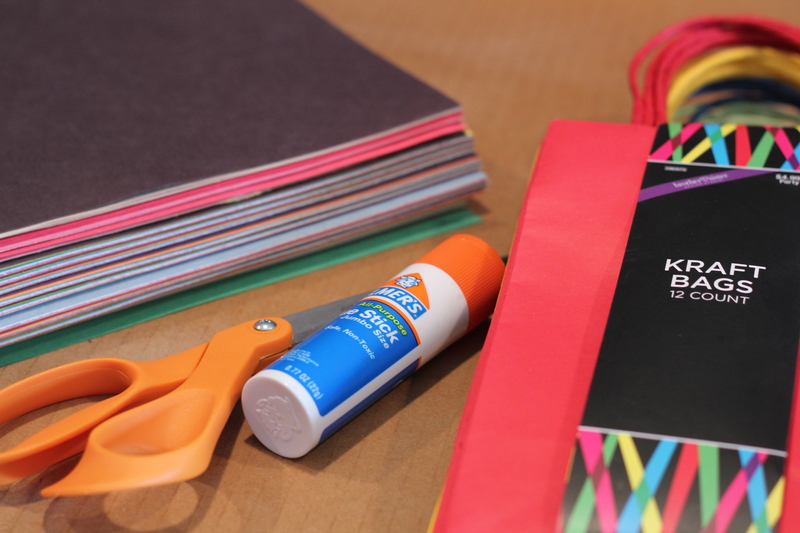 4) Glue everything onto your bag. That’s it! 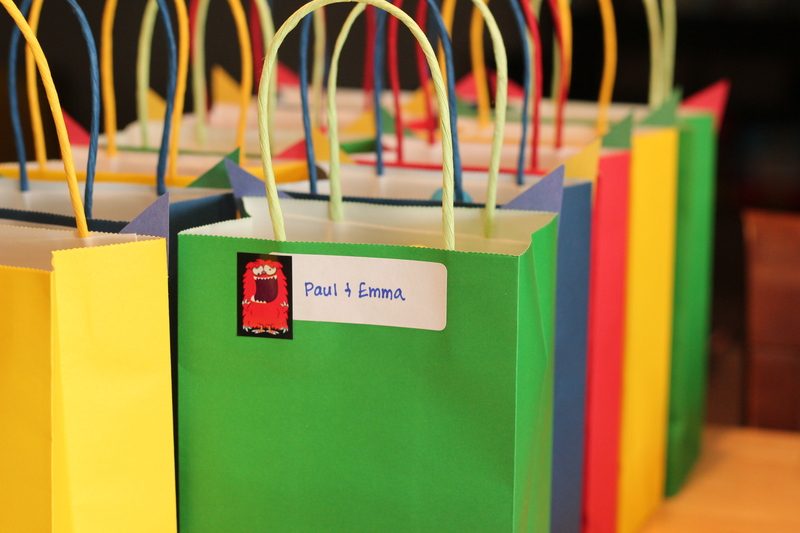 I went a step further and labeled each bag on the back with just a regular name label. 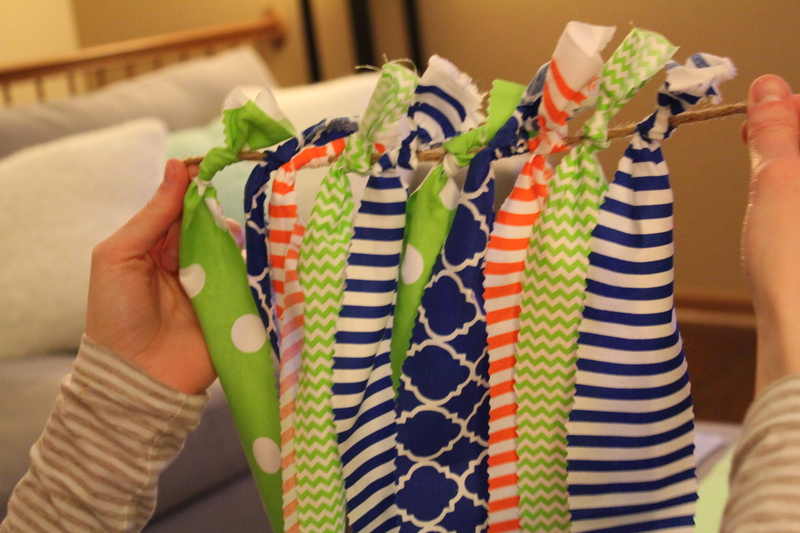 These favor bags were the easiest of the favors and turned out cute! 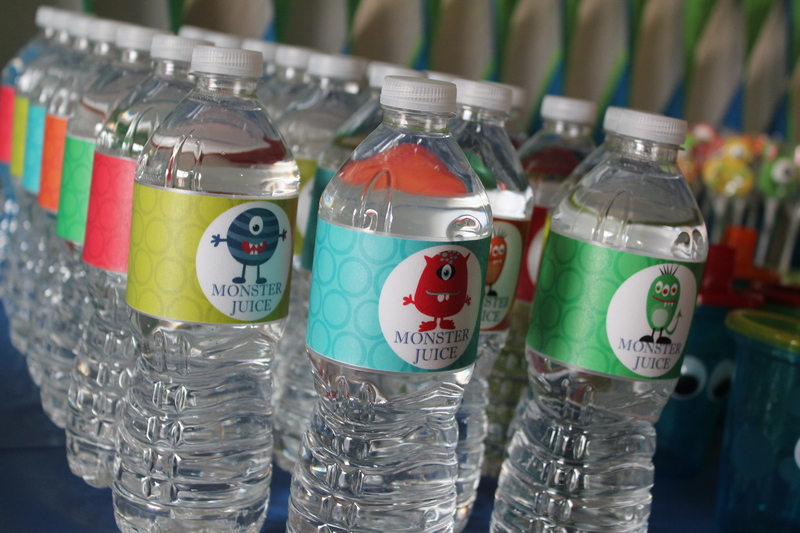 I like that the monsters look super friendly and fun and the favors were a hit too. 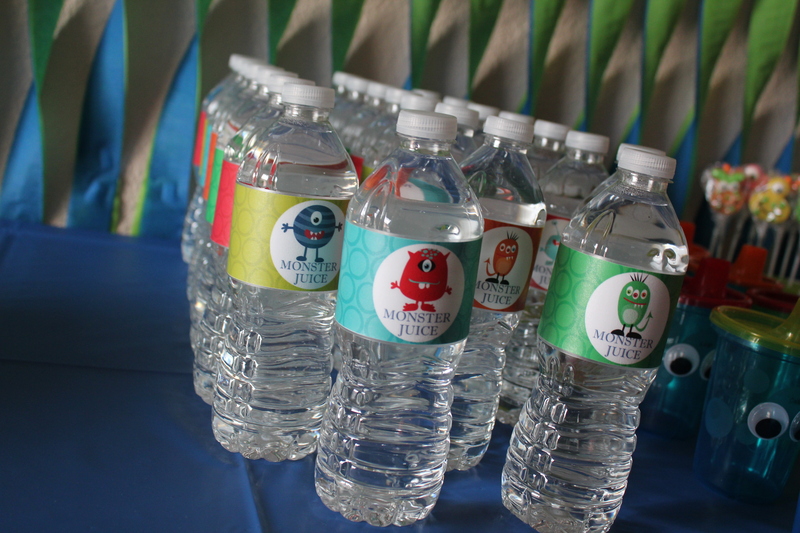 Making these water bottle labels was a little time-consuming, however, they turned out so cute and were one of my favorite touches to the party. If you are looking for a fun DIY to try, I definitely recommend trying these! They will be nice to do for future parties now that I have the technique down. They are waterproof too, which is a bonus! 1) Remove the labels from your water bottles. 2) Cut out your individual labels. 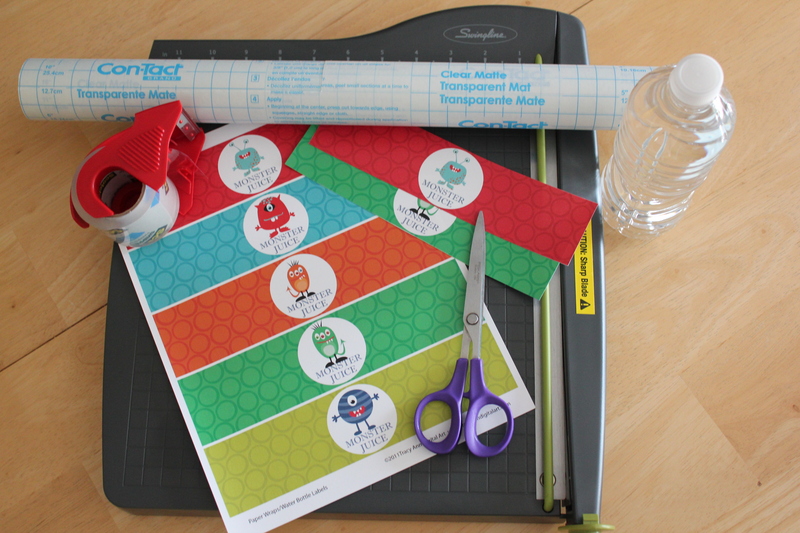 I used a paper cutter (found here), but you could cut them out individually too. 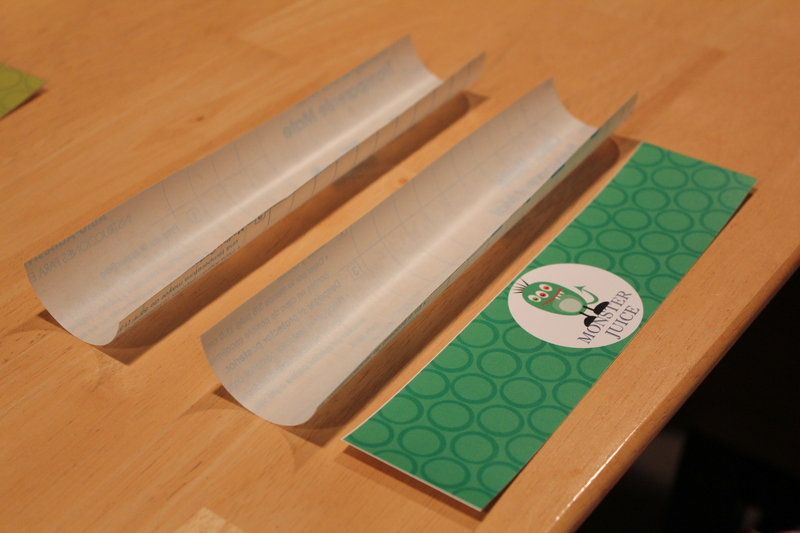 3) Cut out two pieces of ConTact paper that will cover the label. Measure this out using the grid on the back of the ConTact paper and make sure you leave enough room on the edges to that they are sealed. If they aren’t sealed, water and moisture will be able to leak through onto the paper label. 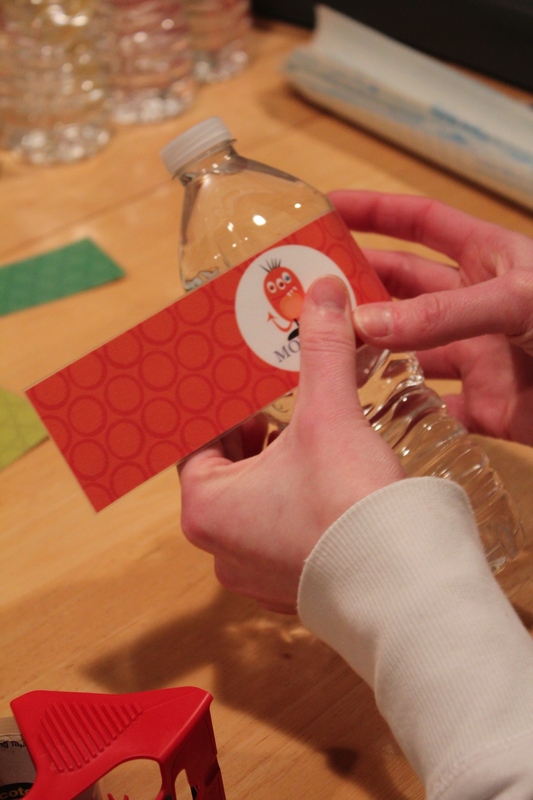 4) Peel the backing off one of the pieces and attach the label to it. 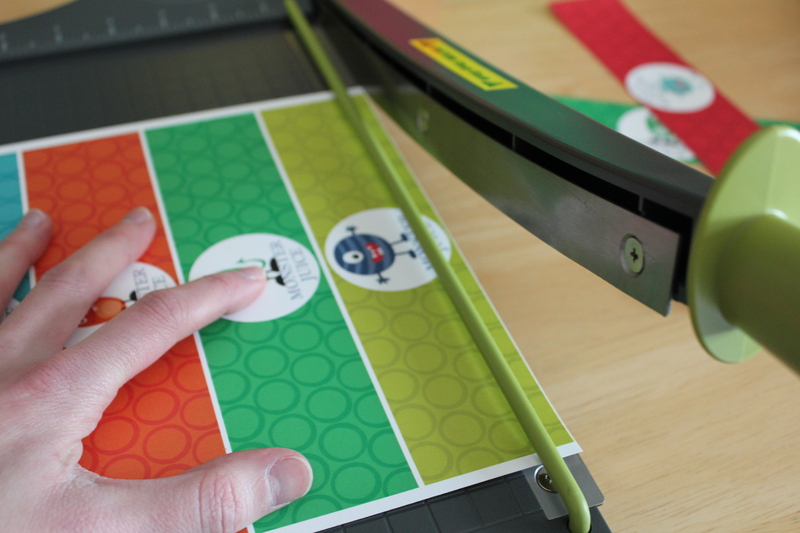 5) Peel the backing off of the second piece and attach to the top of the label. Smooth out any bubbles or wrinkles. 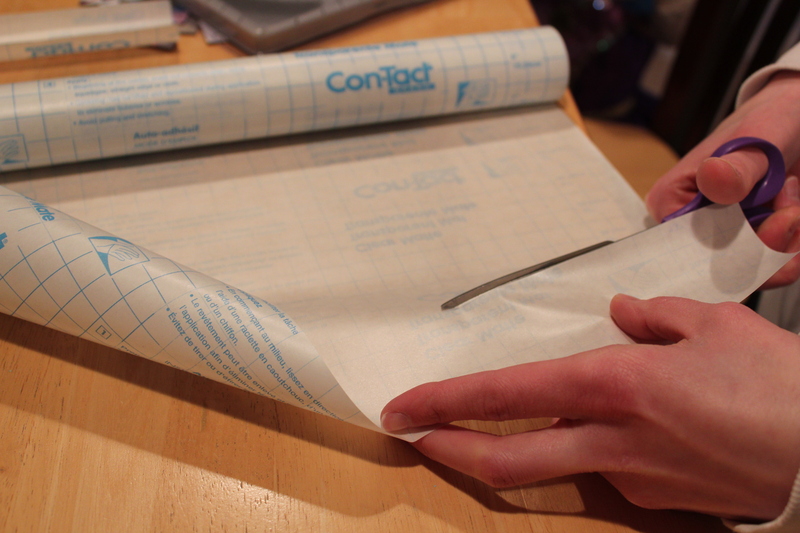 6) Cut off any excess ConTact paper on the sides. Again, make sure you leave some of an edge, but you don’t need a ton. 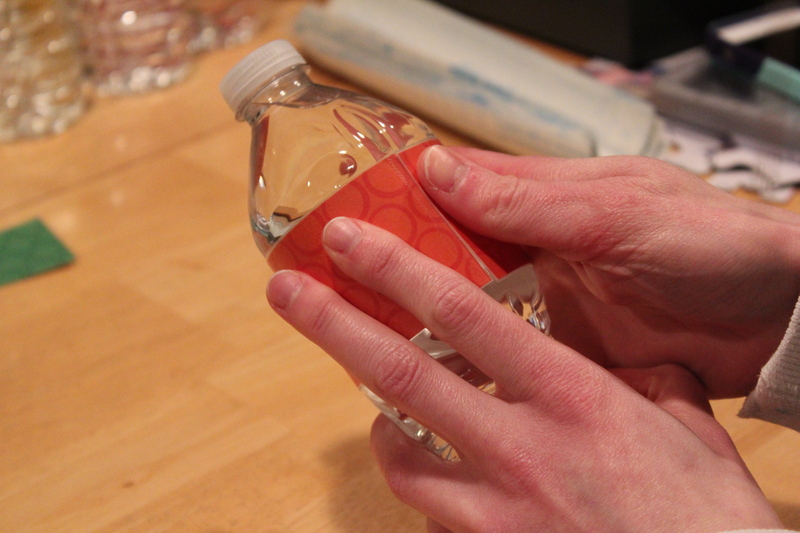 7) Wrap the label around the bottle and tap closed using packing tape. That’s it! Once you get a system down it really isn’t as tedious as it seems, especially if you don’t need to label many bottles. And, because the paper label is covered, you can put these in the fridge and they won’t bleed or be ruined as they get to room temperature. Hope you have some fun with this! 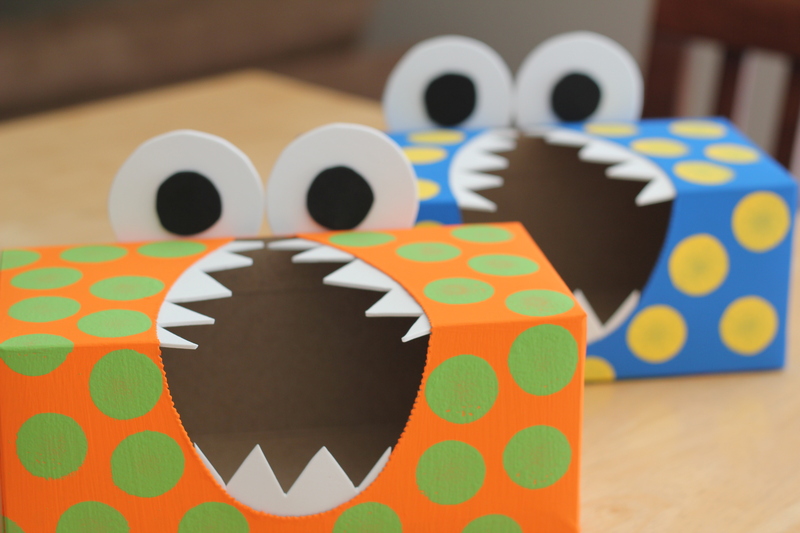 One of the fun DIY projects I completed for Gavyn’s monster birthday party were some monster utensil holders, made out of tissue boxes. They were inexpensive, not very time-consuming and they added some fun flair to the food table! 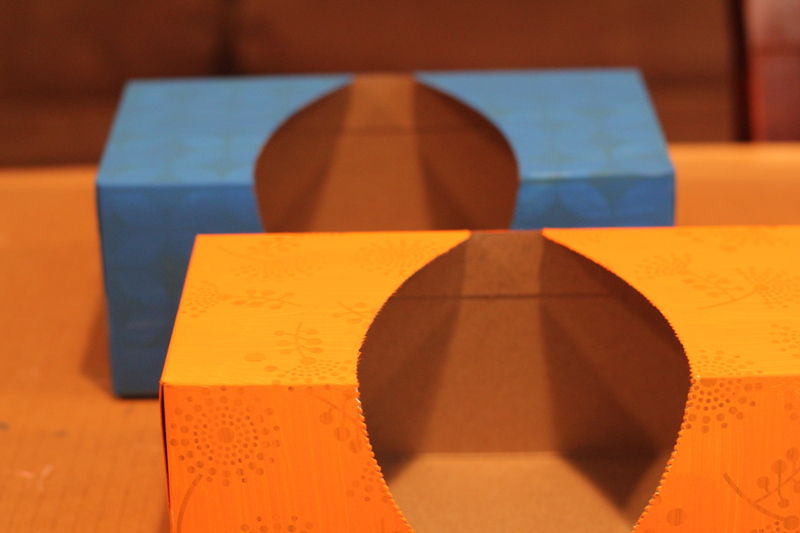 Empty Tissue Box: I used Puffs boxes because I liked the openings of the box and didn’t have to do anything to change their configuration. 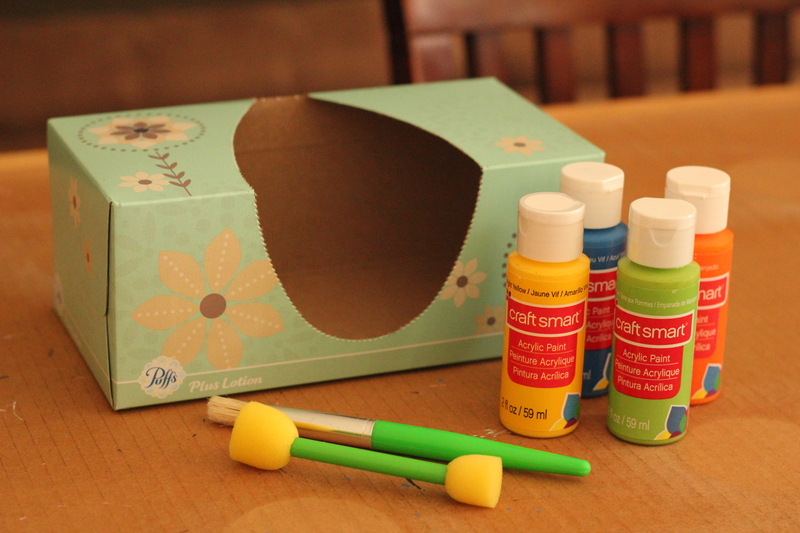 1) Paint your tissue box. Let the first coat dry and apply additional coats as needed, while allowing them to dry in between. This shows the boxes after one coat of paint. The orange took several coats of paint, while the blue only took a couple. 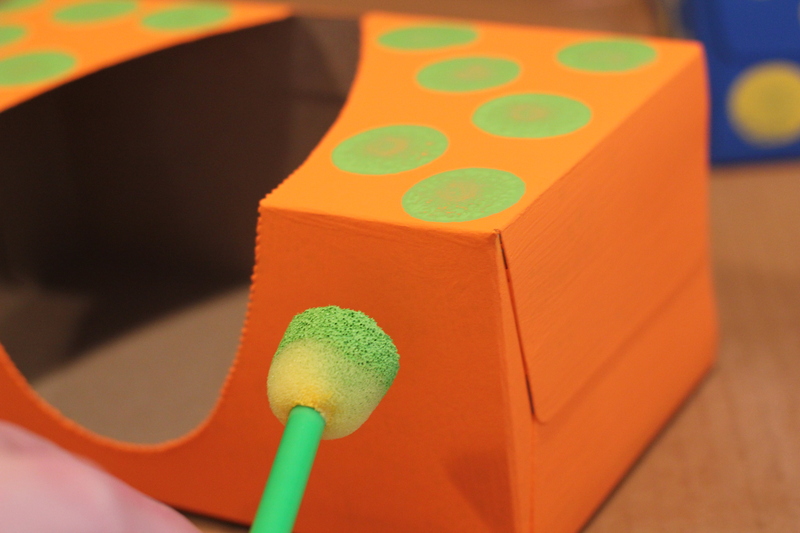 2) Use the circular sponge to create little dots with the paint. Dip the sponge in the paint and just press down firmly enough to create a circle. Allow for this to fully dry. 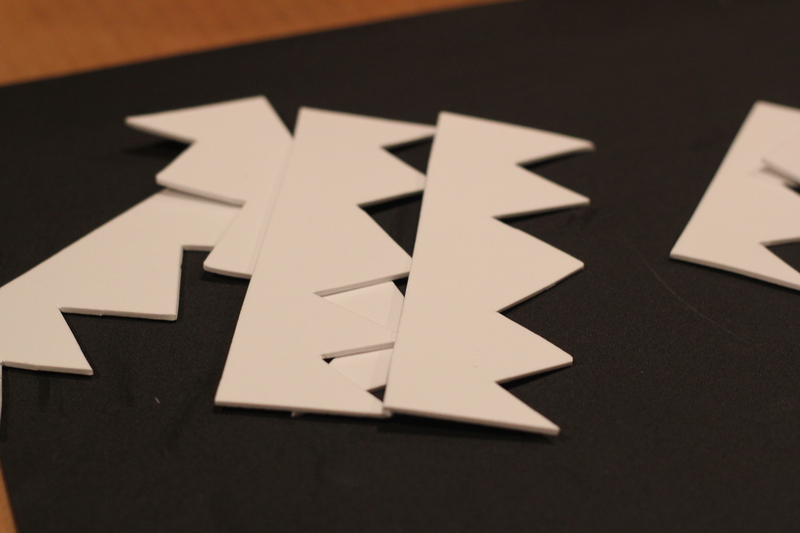 3) Cut out teeth from the sheet of white craft foam. Glue the teeth down inside of the box openings. I used a regular craft glue to do this and they held up great! Don’t worry about having perfectly cut teeth — these are monsters! 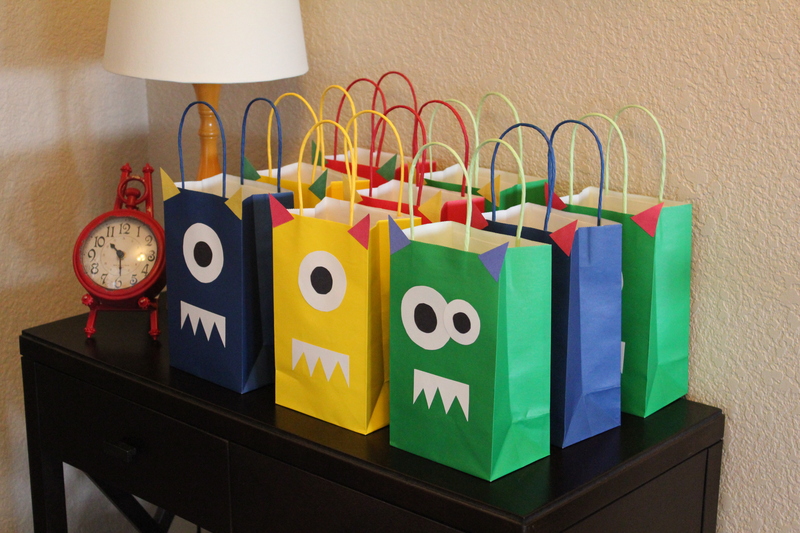 They don’t need to be perfect looking (honestly, most of the DIY things I did for this party were slightly off in design on purpose because they are supposed to be monsters!). 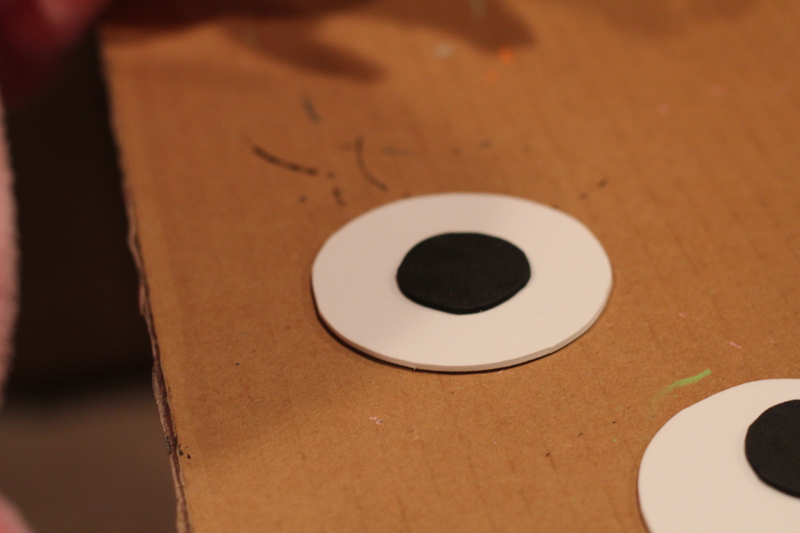 4) Create eyes using the black and white craft foam. I traced the whites of the eyes out, using a random toy food can. 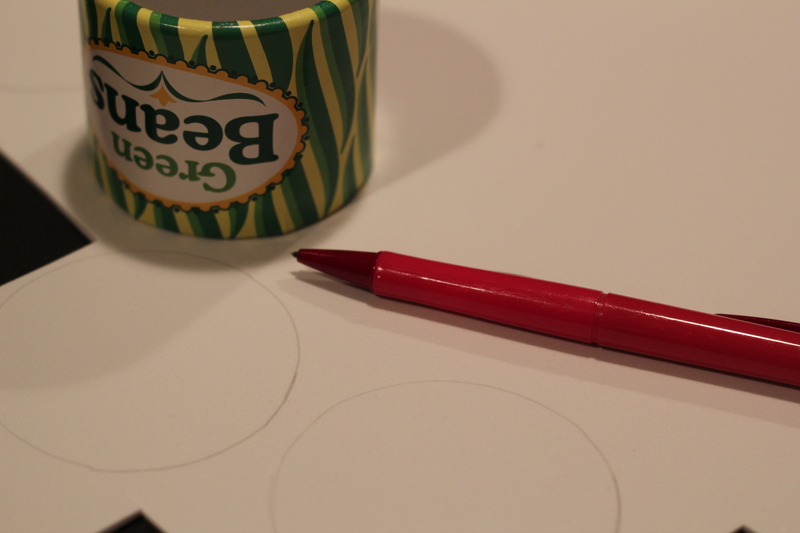 Just find something around you that is the size circle you want for the eyes and use that for tracing. Again, no need for perfection here either! 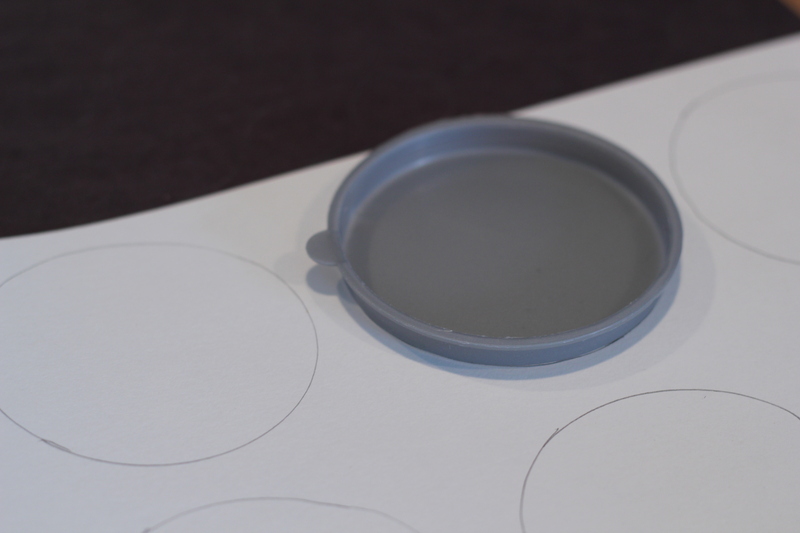 Glue the black circles onto the white, using regular craft glue. 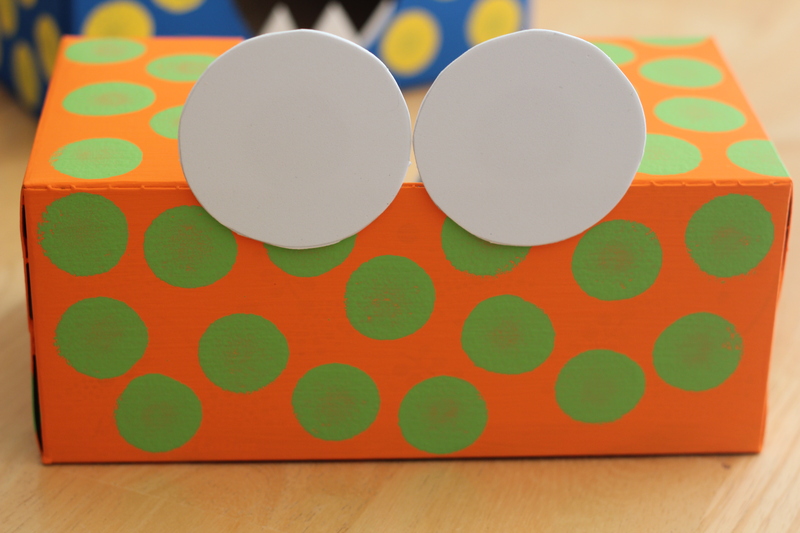 5) Glue the eyes onto the back of the tissue box. 6) Fill your boxes with the utensils of your choice and you are all set! Simple and fun! See you back here tomorrow for Friday Favorites!